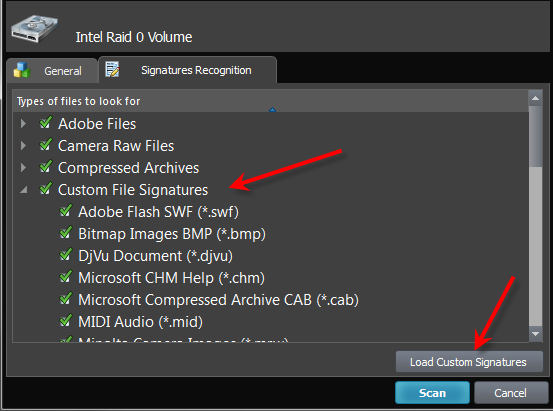 In case if recovery software is unable to detect deleted files after QuickScan or SuperScan (for example, when directory area keeping file headers is wiped out or overwritten by other data), the only chance to recover files is to search for file signatures. In this case un-fragmented files can still be detected and recovered. 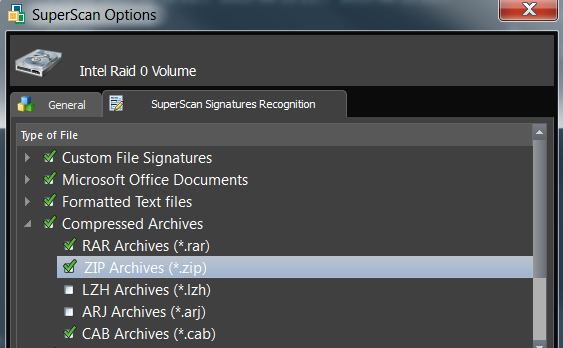 Active@ File Recovery comes with more than seventy predefined (internally programmed, very fast) standard file signatures to be analyzed while SuperScan (MS Office Documents, Photo Camera Image formats, ZIP/RAR Archives, Music & Video MP3/MP4, etc..). For expert users there is advanced programming language which allows to define custom file signatures for Active@ File Recovery to search for specific data formats. Active@ File Recovery offers advanced tools to define user's templates for signatures to be analyzed. Signatures can be described using extended definition language RegExp (Regular Expressions). Use Attribute-based folder depth parameter to organize recovered files in a specified number of sub-folders. 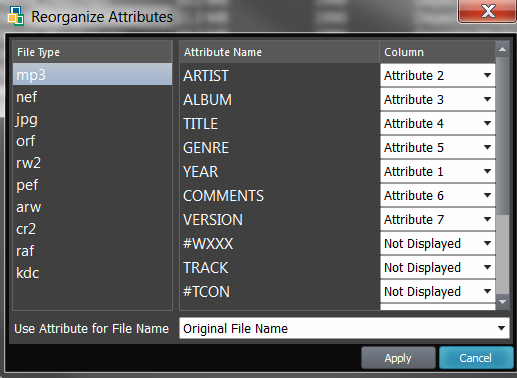 For example, for the MP3 files default columns are Artist, Album, Title and default folder depth is 2. When you recover MP3s using default parameters, your music files will be organized first by Artist, then by Album, so all album songs will be in one folder. If you reorganize columns display like in example above (Year, Artist, Album,…) and specify folder depth 3, after recovery you'll have music grouped in folders first by Year, then by Artist, then by Album. Sometimes advanced users need to detect more specific file formats, not being described in standard set of file signatures. Active@ File Recovery offers advanced tools to define user's templates for signatures to be analyzed. Signatures can be described using extended definition language (including scripting and calculation capabilities) which also complies with RegExp (Regular Expressions). See language definition and syntax below. ;     - MAX_SIZE - non-required. 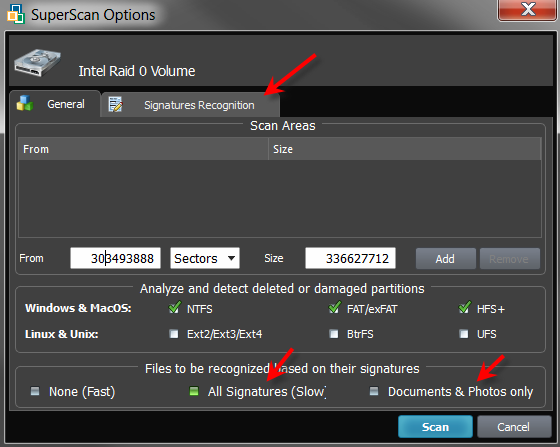 Maximum file size to force file-end, if no file-end signature is detected. By default it is 64Kb. ;     - EXTENSION - non required. This is a file extension to be displayed on a screen. ;     signature      - expression (regular or RegExp-compatible). Expression max length is 1024 bytes. ;     If there are several fields listed in signature beginning, logical AND operation applied to confirm file start. ;     signature       - expression (regular or RegExp-compatible). Expression max length is 1024 bytes. ;     If there are several fields listed in signature beginning, logical OR operation applied to define file end. Regular Expressions can be used while defining signature headers and footers. Please check RegExp syntax on the web.